Ernst Sagebiel (2 October 1892 in Braunschweig (Brunswick) – 5 March 1970 in Bavaria) was a German architect. Sagebiel was a sculptor's son, and after his Abitur in 1912, he began his studies in architecture at the Braunschweig University of Technology. He eventually finished his studies in 1922, after they were interrupted by his participation in the First World War, which included a stay in a prisoner-of-war camp. In 1924, he joined Jakob Körfer's architectural bureau in Cologne. In 1926 came his doctorate ("Promotion"). In 1929, Sagebiel took up a job in Berlin as a project leader and chief executive officer at the architect Erich Mendelsohn's office, but in 1932, he had to leave this job owing to the severe economic climate in Germany at that time. He worked as a construction foreman. 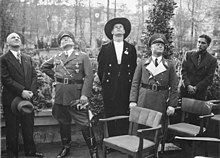 After Adolf Hitler and the Nazis seized power in 1933, Sagebiel applied for membership in the NSDAP, and became a member of the Sturmabteilung (SA). Already by 1933, Sagebiel had, at his brother's suggestion, come to be at the Deutsche Verkehrsfliegerschule ("German Commercial Flyers' School"), which was a front organization involved more with Germany's air force buildup than with commercial flying. As of 1934, he was being trusted with planning, as well as overseeing construction of, numerous Luftwaffe barracks (in Döberitz, Berlin-Gatow and Kladow, to name a few) as leader of the special works unit. Sagebiel's austere building style, which when compared to Albert Speer's rather classicist tendencies came across as very stark and linear, was described as "Luftwaffe modern", owing not least to his close association with the Luftwaffe. With his earlier building of the Reich Air Transport Ministry for Hermann Göring, which came earlier than Albert Speer's exertion of influence on the National Socialists' architectural parlance, Sagebiel set a trend that would be recognizable throughout the Third Reich. From 1938, he was directly subordinate to the Air Transport Minister, Hermann Göring, and was thereby counted among the Reich's most important architects. In the same year, he became a professor at the Technische Hochschule Berlin. With the outbreak of war against the Soviet Union in 1941 came an end to all Sagebiel's building plans. Wikimedia Commons has media related to Ernst Sagebiel.